The latest development on Ring Road construction of Kathmandu- Lalitpur has been showcased in this video. Right now the workers are busy marking the lanes from Balkhu to Ekantakuna section. Kathmandu Ring Road Construction - Thermoplastic road Line markings. Ring Road is a four-lane two-way ring road circling around the cities of Kathmandu and Lalitpur. The total length of the Ring Road is 27 kilometres (17 mi). 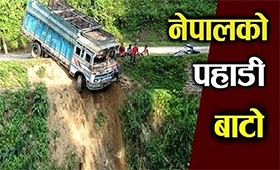 The road connects major places like Kalanki, Satdobato, Gwarko, Balkumari, Koteshwar, Tinkune, Tribhuvan International Airport, Gaushala, Chabhil, Sukedhara, Maharajganj, Basundhara, Samakhushi, Gongabu, Balaju, and Swayambhunath. A section of 9.5 kilometres (5.9 mi) is currently being expanded eight-lanes in cooperation of the Chinese government. The government has decided to expedite construction of the proposed 71.93 km Outer Ring Road.